Blood ‘n’ Thunder returns to quarterly frequency with the Summer 2014 issue, which will debut at the upcoming PulpFest and be mailed to subscribers and wholesale customers in August after we return from the convention. Those of you only just receiving your copy of the 2013-2014 triple-sized Special Edition (due to a mistake incurred during the recent retooling of BnT‘s subscriber database) probably won’t even get a chance to finish reading it before the new one comes along, but that’s not a bad thing, right? Our lead feature is a survey of the short-lived, barely remembered All-American Fiction, a meritorious Munsey/Red Star title that boasted some of the best writers in the business but failed to click with readers for reasons unknown to this day. Larry Latham, who penned last issue’s “Birth of the Pulps” article, is back with a look at nickel-weekly characters (including Nick Carter, Frank Merriwell, and the Liberty Boys) who transitioned to moving pictures in the early days of the film industry. And you’ll be treated to a detailed look at an aspect of the pulp business almost never written about: the litigiousness of publishers who zealously guarded what they thought were proprietary rights. You’ll read extracts from a 1936 lawsuit filed by Ned Pines’ Standard Magazines against Harry Steeger’s Popular Publications, claiming that the latter’s Ace G-Men infringed on Standard’s G-Men. It’s fascinating stuff, believe me. Finally, the “Blood ‘n’ Thunder Reprint” this issue comes from a 1922 issue of Adventure. 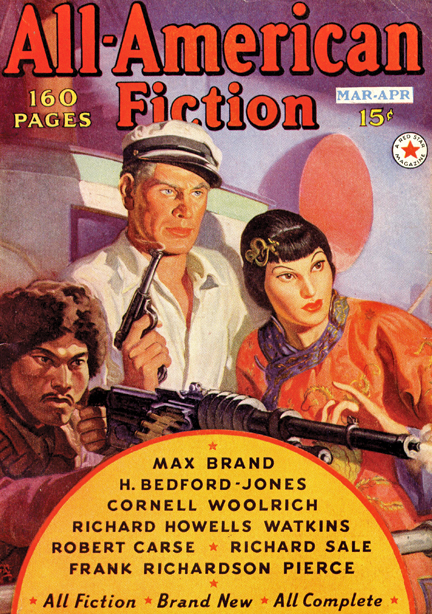 “The Tenth Man,” an eerie tale of African intrigue written by Robert Simpson, was scheduled for inclusion in the last issue but got squeezed out when our book-length novel reprint ate up more pages than originally expected. All in all, we think the Summer 2014 BnT will be another fine issue. If your subscription expired with the triple issue — and most did — you can renew it right here on the Murania Press site.